Entertaining & Educational Pirate Music for kids & kids at heart. Sailin' from pop-We RRR the Pirate People, to historical folk-1717 (Black Sam Bellamy), to surf-FP's Raingutter Regatta, and ports between, with songs for Birthdays, Mothers Day & Yuletide. My name, Rockin' Ron the Friendly Pirate says it all. I'm rockin' musically and like a ship on the ocean. I’m Ron because that’s what my mom named me. I'm friendly in my attitude and the messages I deliver. Most importantly I’m a Pirate, so I’m interested in things nautical, I can be mischevious, and of course I love to have FUN. Dan Bolles of Seven Days (Vermont's Arts & Entertainment Weekly) compared my approach to that of Toy Story and Shrek. I try not to dumb down my material, I believe I speak to kids with respect, and I like to make adults laugh and sing along too. 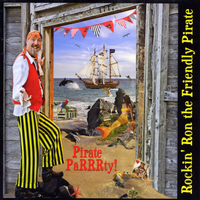 Pirate PaRRRty!, like my first CD “Give Me an RRR!”, has a wide range of styles and moods. From pop/dance, to sea chantey, to lullabye, to marching band, to punk rock, I keep your ears on their toes. I incorporate pirate and sea references in the songs with lots of puns, silliness, and buccaneer bravado.